Okay, now a brief hiatus from chopping and cooking and baking (oh my!). 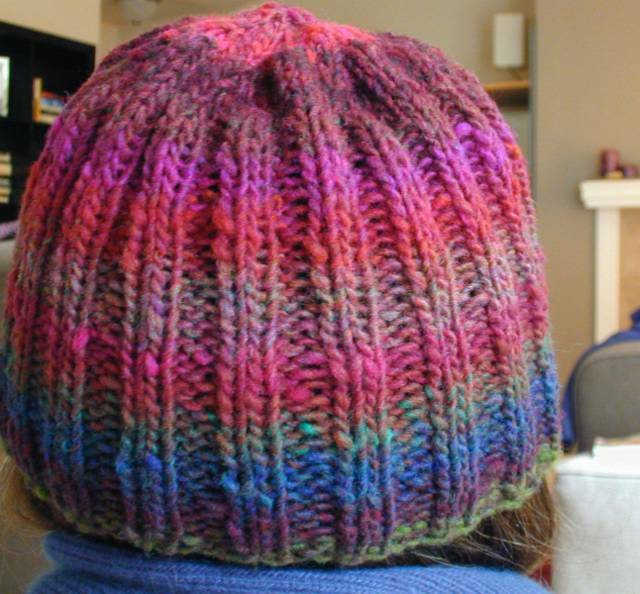 I'm trying to think of quick, nice knitted holiday gifts, and I was thinking that ribbed hats would be a cinch. I'm really pleased with how my Kureyon Kap turned out, but the wool is too itchy for most people, I think. So, Noro Silk Garden has the same cool color effects, and the same yardage/gauge as Kureyon. But I can't find any info about the softness of this yarn! Has anyone out there used Silk Garden? Is it soft enough to be used as a hat or scarf? Wool Needlework Discounters has a great price for Silk Garden, so I think this would be an inexpensive, hopefully appreciated, gift for lots of people on my list.